1. This is an internet only auction. All bidding is online. The bidding for this auction will close on Thursday, April 18th, 2019 at 7:00pm. Lots will close approximately every 20 seconds. 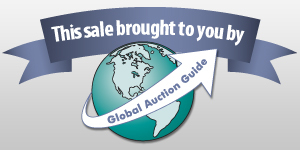 This auction uses a soft close, which provides an authentic auction atmosphere. Items will remain open for one minute after the latest bid. At 6:30pm a new, flashing button will appear allowing you to watch the auction close with a live countdown. This allows you to bid on the next 12 items scheduled to close without refreshing the page.2. A preview will be held on Tuesday, April 16th, 2019 from 4pm - 6pm at 5987 River Rd, Conestoga, PA 17516. 3. Pickup of your winning purchases will be Monday, April 22nd, 2019 from 2pm - 6pm at 5987 River Rd, Conestoga, PA 17516.4. All items are offered and sold "AS IS, WHERE IS" with all faults. We encourage you to come to the preview to see and inspect the items. 5. All descriptions are believed accurate but not warranted. Measurements are approximate. 6. NOTICE: H.K. Keller will not be able to hold any items for pick up beyond the stated times. Everything must be picked up by 6pm Monday, April 22nd, 2019. Buyer will be charged the full amount for items not picked up, and will forfeit their right and claim to the property. 7. By placing a bid, bidder signifies that they have examined the items to their satisfaction, or that they have chosen not to personally examine them. 8. H.K. Keller reserves the right to reject any bid and/or bidder at our sole discretion. 9. Applicable taxes include PA sales tax of 6%. If you have a sales tax exemption for resale or another reason, H.K. Keller needs a copy of the certificate on file in order to remove sales tax. Please email [email protected] with your copy. 10. This auction has a 15% buyer's premium and 6% PA sales tax. This means that a final bid of $100 plus the buyer's premium constitutes the total purchase price of $115 with sales tax of $6.90 for a total due of $121.90.11. You will receive an invoice listing the items won within a few hours of the auction closing. Your credit card will automatically be charged for amounts under $1,000. For invoices with a charge of $1,000 or more, you will receive an unpaid invoice with instructions on how to make payment. Our office may contact you regarding payment options. Cards accepted include MasterCard, Visa, American Express and Discover only. Buyer's purchases will be paid with the credit card used to register for this auction if the bidder does not show up. 12. By bidding in this auction, you are agreeing to all of the terms posted for this auction. 13. If you need shipping services you can contact our local UPS Store or our local Postal Connections and they will be happy to help you. UPS: Contact Kris or Dave, [email protected], 590 Centerville Road Lancaster, PA 17601, 717-898-9303 Postal Connections: Contact Peter, [email protected], 1653 Lititz Pike Lancaster, PA 17601, 717-399-9076 14. There are no shipping, transporting or packing services offered by H.K. Keller. 15. There will be a $40 returned check fee for any declined check received. 16. Declined credit cards can result in a buyer being banned from participating in future auctions. H.K. Keller is a member of the National and State Auctioneers Associations. Non-paying and/or fraudulent bidder names may be shared with other auction companies. 17. Buyer will be charged the full amount for items not picked up, and will forfeit their right and claim to the property. Unclaimed lots may incur up to a $25 removal fee based on the size of the items. 18. This is a public auction and not a retail setting. All sales are final. No returns or chargebacks are accepted.19. Some items may be sold per piece. The bid price is multiplied by the amount of items in the lot. This is shown using the bid price x quantity. (Example ?$12.50 x 4? equals a total bid of $50.00). Announcement:Information contained herein is presented on behalf of the seller. H.K. Keller, agent for the seller, cannot guarantee the information to be correct or assume the liabilities for errors and omissions. All lines drawn on maps are approximate. Buyers should verify the information to their own satisfaction. Any announcements made from the auction block on day of auction will take precedence over any matter of print and will be final.